Known as a "window to the past " amber is fossilized tree resin containing prehistoric plant material insects and strands of DNA. It has been appreciated for its beauty and unique properties since Neolithic times. Since the dawn of man the mysterious properties of amber pebbles found on the shores and in coastal forests have captured man's imagination. When burned in a fire amber releases a pleasant sticky scent and aromatic smoke. When rubbed it attracts other items towards itself with a magic we now know as static electricity. Amber is a 40-to 60-million-year-old fossilized resin that trapped many prehistoric plants and insects during its formation. Researchers have cataloged amber pieces containing more than 1 000 extinct species of insects. The name amber was derived from the word "amber" from Middle English "ambra" which is directly from Medieval Latin and "anbar ambergris" from Arabic. Amber pieces can take a low heat application to alter trapped water bubbles producing discoid fractures (disk-like or radiating) known as sun spangles. • Amber is associated with love strength luck healing protection and the gift to soothe stressed nerves. 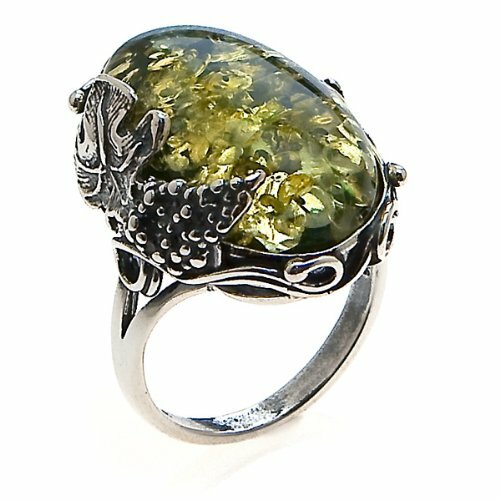 • In ancient times amber was believed to have magical powers. It was warm to the touch light weight emitted static electricity when rubbed and gave a pleasing aroma if heated. People wore it to protect them from evil and negative energy. • Early civilizations burned amber to cleanse the air especially during childbirth. It was also though to correct eyesight by gazing into it. • As early as 8000 BCE beads and pendants of amber were among the treasures found in gravesites in the northern part of Europe and archeologists have found amber artifacts dating back to prehistoric man. Amber carving dates back to around 7000 BCE. 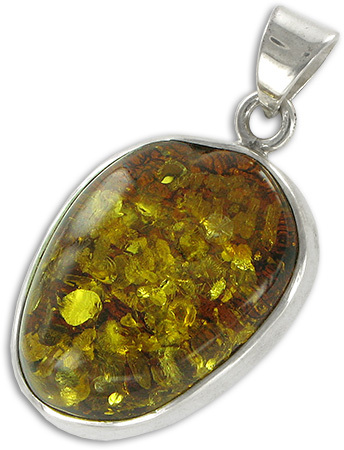 • The Ancient Greeks referred to amber as 'Elektron' because it can develop static electricity when rubbed. • In Roman mythology Phaethon the son of the sun-god Helios persuaded his father to let him drive his chariot across the heavens. Phaethon steered too low scorching the earth. To save the planet Zeus struck down Phaethon with a thunderbolt and killed him. In their grief Phaethon's family turned into trees. Their dried tears became amber. 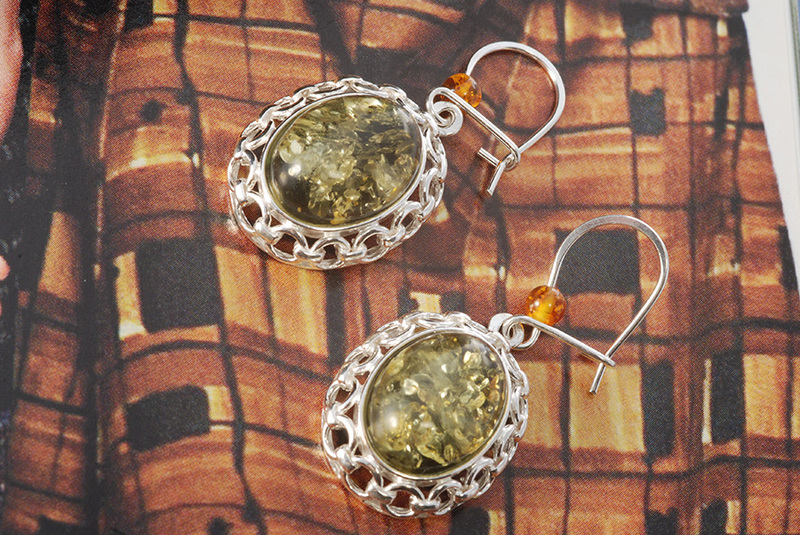 • The Roman Emperor Nero was a great connoisseur of amber. During his rule the price of an amber figurine was said to exceed the value of a healthy slave. • In the movie and novel "Jurassic Park " dinosaur DNA was extracted from a mosquito trapped in amber. Location: Baltic Sea region of Russia. 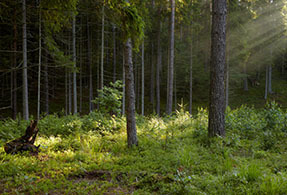 The largest amber deposits in the world are located in the Baltic Sea region of Russia. 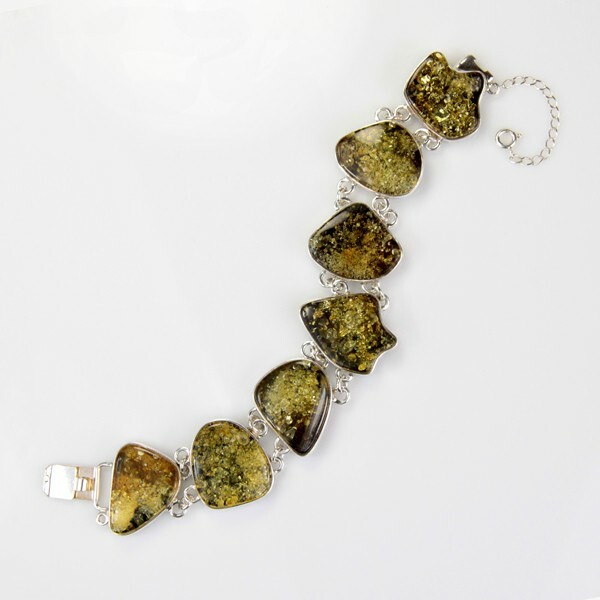 Green amber has long been identified with the pre-Columbian cultures of Mexico South and Central America especially the Mayan civilization. While green amber is available from both the Baltic region and the Americas Shop LC sources its Amber from the Baltic Sea region of Russia. • Ranks 2 to 2.5 on the Mohs hardness scale. • Amber presents in various shades of golden brown including pale yellow honey burnt orange dark moss blue and black. • Sourced from the Baltic Sea region of Russia. • Amber is not your typical gemstone. Technically it is organic material. It is a mixture of organic compounds like hydrocarbons resins succinic acid and oils. However it didn't develop the crystalline structures present in other gems.